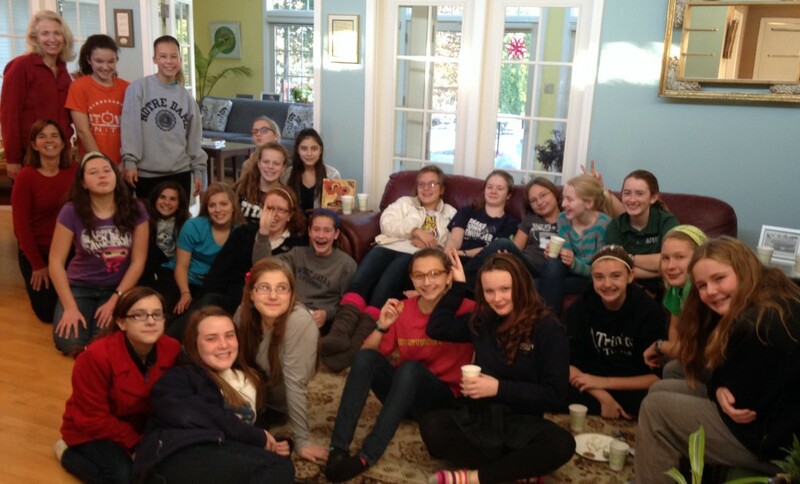 The girls of the seventh, eighth and ninth grade girls' youth group. Story by Chris Meehan and Elizabeth Grams. Photo by Andrea Kane. South Bend branch members collected winter coats, hats, gloves and scarves this November. They sent 925 pounds of coats to Ukrainian refugees and 15 bags of hats, gloves and scarves to a local homeless center. Beth Preuss was at a 25th wedding anniversary party for Gus and Karen Zuehlke when she first heard about the need for winter coats in Ukraine. Mike, a former missionary with ties to Christian aid agencies in Ukraine who asked that his real name not be used, planned to send a shipment of coats to help the refugees fleeing the conflict in the South and Eastern parts of the country. According to a recent UN report, close to one million Ukrainians have sought asylum either within Ukraine, in Russia or in other neighboring states. Many fled their homes last summer, expecting to leave for only a short time, but the continuing conflict has left them with few options. With only 13 days to go until the shipment of clothing left the U.S., Beth sprang into action. She contacted the pastor of her church, Christ the King, and spoke with John Lee, the head of Trinity School at Greenlawn, about collecting coats in their locations. Both agreed. Her husband, Rich, volunteered to organize the drive at his workplace. The South Bend branch also ran a notice about the collection in the branch bulletin. Trinity’s Student Life Committee decided to make the drive part of their annual spirit competition between classes, which led to widespread student participation. All in all, Mike filled 19 large boxes with coats from Beth’s three sources and from other South Bend branch members. The total came to 925 pounds, which included 239 jackets, 152 sweaters, 29 coats, 53 pairs of boots, 58 pants, 14 vests, 66 hats, 61 scarves, 32 pairs of gloves, and 24 pairs of socks. Several families donated money to help with shipping the coats, while a few more families held a bake sale to raise funds for the shipping. The boxes will reach their destinations in Ukraine in time for the Ukrainian Orthodox Christmas, which is celebrated on January 7. Two organizations, Hope to People, in the city of Rivne, and Light in the East, in Kiev, will distribute the supplies to refugee families they support, and to other Ukrainian Christian organizations involved in relief work. “I am very grateful for the overwhelming response,” Mike wrote to the South Bend branch. The girls spread the word about the need for hats, scarves and mittens among branch members, and they went door to door in the Kanes’ neighborhood asking for donations. They also made 55 fleece hats and scarves. “All in all we sent 15 large bags and boxes to the homeless center,” says Andrea. What a heartwarming ( and body warming) way to be Christ to others! Very inspiring. I'm so glad Christ is so visible among us and so busy taking care of the needs of others! Thanks one and all! Truly the Lord is at work! What a wonderful outreach for our children and grandchildren. Love is best expressed in action. Great work people.